The Arts Theatre (now known as the Leggate Theatre) though primarily a teaching venue was also used for smoking concerts, elaborate soirees, student councils, plays, guild meetings, public lectures, and degree ceremonies. It originally seated up to 500 people although now the capacity is around 230 as the upper balcony is no longer in use. Principal Rendall’s input to the design of the building also allowed the theatre to be adapted for examinations. The cubic blocks on the 2nd, 4th and 6th tiered rows could be removed to form platforms for tables and chairs. In 1990 the platforms were removed so that wooden chairs from the Surgery Lecture Theatre could be reused. The Arts Theatre was renamed the Jack Leggate Lecture Theatre in 1990 in memory of the former Dean of the Faculty of Medicine (1953-1969). Bob Connelly was the Honorary President of the Faculty of Medicine in 1975 and remembers how Jack practically ran the department single-handed. Although he was strict with matters concerning the faculty, he had a warm and humorous side too. Liverpool Medical Students' Society held their meetings in the lecture theatre from 1990-2006 and you can still see the names of students from the Medical Students Society. 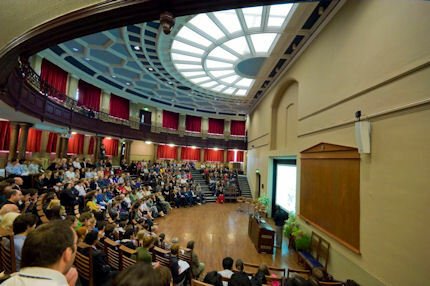 The Leggate Theatre has been refurbished as part of the major renovation of the Victoria Building and this space now hosts regular student & public lectures, Wedding ceremonies and music concerts.